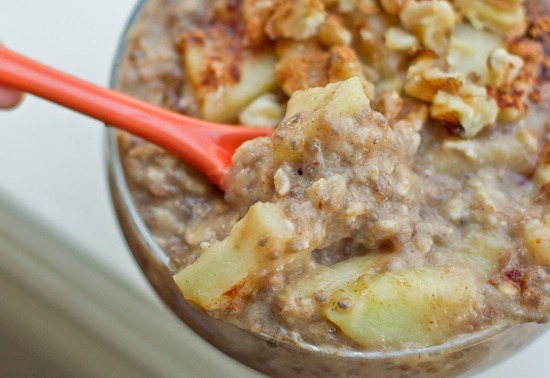 You are here: Home / Uncategorized / Apple pie oatmeal for breakfast? Don’t mind if I do! Apple pie oatmeal for breakfast? Don’t mind if I do! 1. In a medium sized pot over medium heat, mix the oats, 1 peeled and chopped apple, 1 tbsp chia seeds, 1.25 cups Almond milk, cinnamon, ground ginger, salt. Mix well. 2. Heat the oat mixture over medium heat for about 8 minutes, stirring often. When the mixture thickens and the liquid is absorbed, it is ready. Stir in the apple sauce and pure vanilla extract. 3. Pour into a dish and sprinkle with chopped nuts, a pinch of cinnamon, and a drizzle of pure maple syrup. Add a tiny bit of almond milk on top if the mixture is too thick for you. This recipe is lovely and filling and made for 2 meals for me, I also added a spoonful of natural peanut butter on top before serving, instead of the chopped nuts. This keeps me nice and full until around 11, when I plan to have a green monster smoothie to make up for the excesses of the weekend! Well it was easter after all, and I tend to have peeps only once a year, mainly because I live in the UK, and can only get them for 10x their actual price on eBay as they are sent over from the US. So that craving being covered, I am good until next Easter! Ok, back on track today. The sun is out today and likely to be the only sun we see all week, so I am going for a run today one my many meetings are over, and I might even do the 30 day shred dvd. That Jillian is a killer!